After weeks and weeks of just making small items like felted wool beads, I guess that I had become creatively frustrated. On Saturday afternoon, I decided to attempt a wet felted nuno style wrap. I've had an idea for a new design in my head for a long time now and just couldn't wait any longer to attempt making it, nor could I stand the thought of doing anymore beads for a few days at least. What I failed to remind myself when I started was that, well, a) I'm rather huge and uncomfortably pregnant and b) I'm only 5 days away from my due date. The stubborn streak in me decided to pretend that it was business as usual anyway and take on the task of laying out and wet felting the wrap in my basement studio - a task that I had not attempted in a couple of months. You can see the results in the photo above. Perhaps it is because the process physically exhausted me or because I'm not particularly fond of the color scheme, but it is not one of my favorite creations. I do like the shape and overall style though and will most likely attempt another wrap in that style down the road at some point. My husband really likes it though and even stated that it was one of his favorites (if not his favorite!) 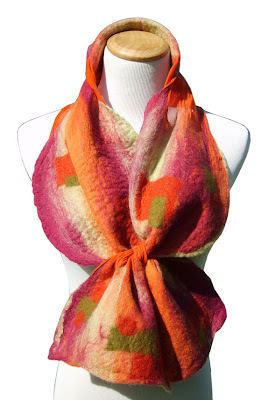 of my handmade felted wool scarf and wrap creations. Considering that I have mixed feelings about it, his encouragement was very reassuring and comforting - he is great in that way! Sometimes I feel like the pregnancy has drained me of all my good creative judgement and capabilities, but perhaps there is hope for me yet. Needless to say, I will be going back to making more felted wool beads today. Although I am happy to have attempted a larger wet felted project, I have realized that I should probably save the rest of my large project ideas for after the baby is born, and I have fully recovered from the birth. You live, you learn. This scarf is lovely. I like the colouring and it has great texturer. I always have mixed feelings about my work. The ones I dont like tend to sell first! It was rather a big challenge with only 5 days remaining. Hope youve got you feet up now to recover. Very nice, beautiful mix of colours! Beautiful! I just love the colors. You did an amazing job five days before giving birth. Maybe it was a kind of nesting instinct to envelope yourself in something large and exhausting.... Hope all goes well and you have a bonny bouncing baby soon.